How Can Modern Stores Maintain Such a Large Product Range? Have you ever wondered how supermarkets cram so much onto their shelves without it all constantly going out of date? Things you would never think of buying, and things only a few need, must need to be cycled regularly. 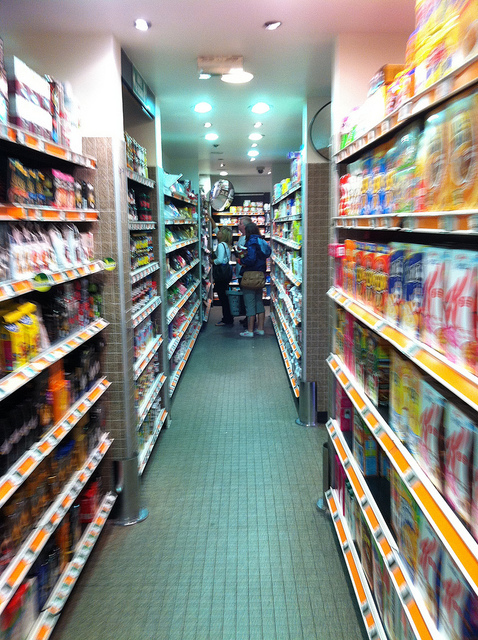 According to some sources, the average supermarket can stock in excess of 12,000 different products. How does a supermarket like Aldi manage to maintain such a wide product range without goods constantly going out of date and being wasted? Most of these are managed through stock rotation. Products with an earlier sell-by date will be pushed to the front of the shelf and those with some time to go until they go bad will be pushed to the back. Adrian Perriss has been a supermarket manager since 1998. His hands-on approach means he spends a lot of time walking around the produce, checking little bits by hand – especially in the grocery isle. Despite personally discarding unsatisfactory fruit and vegetables often, his store only wastes a tiny amount each week – £4,200 on items reduced for sale and £400 worth thrown in the bin. He attributes these figures to his supermarket’s particular method of ordering, which is done manually rather than by a computer. Each section of the store is managed by a department head who know how much they are selling and how much they are wasting at any particular time of the week. Decisions are influenced by the weather and sales records. Many stores nowadays will package sandwiches and bat fresh products, like bread, in store. This allows the premises to be flexible and adjust stock throughout the day. In terms of getting their products, most supermarkets will be supplied from large bulk warehouses and giant freezer stores. Some of these will be owned by the supermarket and some will be independent. In January 2013, the UK’s biggest supermarkets rejected claims around half of the world’s food is thrown away as waste. According to the BBC, the British Retail Consortium said supermarkets have “adopted a range of approaches” to combat waste – despite the Institution of Mechanical Engineers claiming the contrary. A study also claimed around 30 per cent of vegetables in the UK were not harvested because of their appearance. This accusation was rejected by the BRC – according to a UK government study, two for one offers are becoming increasingly rare. It was noted by some that the claim was based on figures from 2008 and looked only at potatoes. It was concluded that six per cent was lost a field level and 22 per cent was diverted to other areas for processing. Tags: Aldi, British Retail Consortium, Products, Retail, Supermarket. Bookmark the permalink.